The famous Dry River winery is based in Martinborough, at the Southern tip of the North Island of New Zealand. The name Dry River carries an historical significance as the name of one of the earliest Wairarapa sheep stations (ca. 1877). This was later sold off by the Seddon government and renamed Dyerville, leaving the renamed Waihora River (circa 1900) and the renamed Dyerville Rd (1994) - both after Dry River - as the only reminders of this part of the area's farming history. In 1979 Neil and Dawn McCallum planted a vineyard a few kilometres from Dyerville in a very dry, gravely and free-draining area now called the 'Martinborough Terrace' and they took the name Dry River for the vineyard and wines in what was to become another chapter of Martinborough's farming history. Their dream was to produce individual, high quality regional wines which faithfully reflect the 'terroir'. In subsequent year's plantings on the Martinborough Terrace increased and fruit from the more recent plantings at nearby Craighall and Arapoff vineyards was also used. Part of Craighall was ultimately purchased by the winery in 1997/8 and all of the Arapoff vineyard in 2002 - the latter being renamed 'Lovat Vineyard'. In 2002 the winery and vineyards were sold to New York businessman Julian Robertson and Californian viticulturalist Reg Oliver, who owned the El Molino winery in St Helena. In the period from 1979 to this point the area of vineyards had increased from only a few acres up to approximately 30 acres under cultivation. There are currently a staff of 7 with Wilco Lam as Winemaker looking after the day to day winery functionsunder the guidance of Antony MacKenzie. Robert Wills is the Viticulturalist and he has with him Rob Smith (Machinery Manager) and a loyal team which includes Nick James and Michelle Mills. Dawn and Neil had been looking for a site for a quality vineyard as early as 1979 and it was clear that Martinborough was the place to investigate. According to friend and soil scientist Dr Derek Milne (later founding partner of Martinborough Vineyard), the virtue of this locality was its 30-year record of the lowest rainfall in the North Island and a heat summation appropriate for growing quality cool-climate varieties such as Pinot noir, Riesling and etc. From the available data, the low rainfall area was limited to a tiny locality roughly 5 km in radius, and a study of soil maps revealed that the deep, free-draining gravels they sought within this were restricted to an even smaller part. By 1986 there were five vineyards and wineries in existence - all planted on the gravels of Martinborough. The pioneers (Ata Rangi, Chifney, Dry River, Martinborough Vineyard and Te Kairanga) decided they would like to define and demarcate the terroir they had adopted, just as such areas are described and mapped in France and Germany, with the expectation that the wines produced from within this area would show similarities reflecting their origin. The crescent-shaped area lay along the edge of the river terrace formed by the Ruamahunga and Huangarua rivers about 20,000 years ago. This is now at the northern side of the township. It was about 1,000ha in total (according to my estimate, about 600ha was available for planting), and was comprised almost completely of free-draining gravels with the same very low rainfall and similar aspect, temperatures, wind-run and so on, and was therefore felt to be homogenous from a viticultural point of view. From 1986, wines made from within this area were given a seal of origin by the 'Martinborough Winemakers Association', and in 1991 the area was named 'The Martinborough Terrace Appellation' to distinguish it from other types of terroir which were being explored nearby. Authentification of the defined area was administered by the 'Martinborough Terrace Appellation Committee' according to a set of rules and regulations descibed as 'Martinborough Terrace Appellation of Origin System'. Many hundreds of wines have borne the seal of origin, although nowadays the physical seal tends not to be used, simply because modern labelling machinery cannot easily apply it. 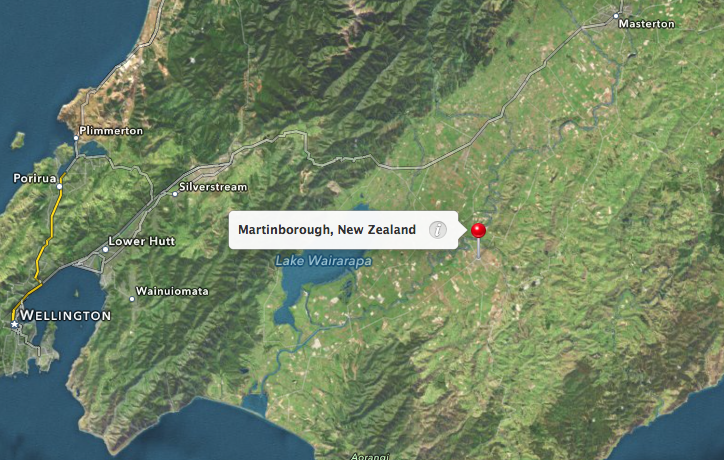 The boundaries of the Martinborough Terrace (previously the 'Martinborough Delineated Vineyard Zone') was precisely and legally defined in 1986. The Dry River wine making philosophy can be summarised by "We have a complete philosophy. That is, the best expression of what we can do in the vineyard. As we go through the winemaking process, the decisions are not in terms of creating a particular style. They are what is best for the fruit, and what is best to preserve the characters that have been harvested. This is the beginning and the end of what we do." On their Pinot Noir on why it ages so well, "A lot of it is in the vineyard. There are still decisions from the winemakers point of view. They are simpler: it is really just a question of pre or post-maceration, and how long. The other thing is that our winemaking is completely anaerobic. We believe in preserving the phenolics, not messing them up. At the end of the day there will always be some sort of light fining just to tune the phenolics. The concept of oxidative winemaking can be necessary, depending on the path you choose. If you haven’t got your phenolics right in the vineyard, then oxidative winemaking becomes necessary to tame the characters that you end up with." Reddish purple in the glass. The nose is dominated by dark fruits, particularly raspberry with a hint of spice and floral notes. The palate is smooth and elegant, with cherries, plum, spice and a hint of earthiness. Balanced with good acidity and refined tannins. A long and generous finish. Very impressive indeed!